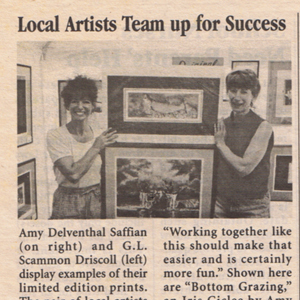 Amy Delventhal Saffian (on right) and G.L. Scammon Driscoll (left) display examples of their limited edition prints. The pair of local artists traveled to North Conway NH in July where they both won awards and then on to South Portland Maine in August to promote themselves and each other. “As self-employed artists in a rural area, the greatest challenge we face is marketing,” said Delventhal Saffian. 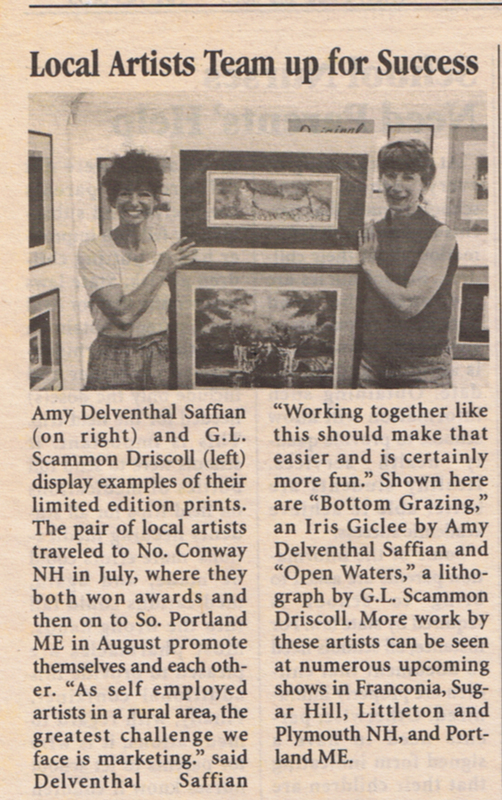 “Working together like this should make that easier and is certainly more fun.” Shown here are “Bottom Grazing” an iris giclee by Amy Delventhal Saffian and “Open Waters”, a lithograph by G.L. Scammon Driscoll. More work by these artists can be seen at numerous upcoming shows in Franconia, Sugar Hill, Littleton, and Plymouth NH, and Portland, Maine.